Like last night (11/5), there are many more Hurricane Sandy Relief benefits going on in NYC. 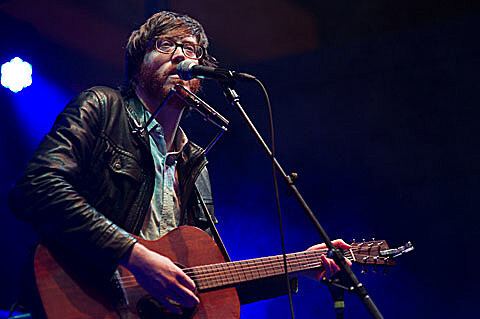 Knitting Factory is hosting a show on Thursday (11/8) with a large (and kind of random) lineup tonight with WIll Sheff (of Okkervil River), Jean Grae, Geoff Rickly (of Thursday), Jennifer O’Conner, Holly Miranda, Jaymay, Bird of Youth, Kevin Devine, Brian Bonz, Jared Evan, Zumo Kollie, Sonya Kitchell, and DJ Rajni Jacques. Tickets for this show are available. The previously mentioned Bad Brains tribute show happening at The Bowery Electric tonight with Bad Brains frontman H.R., Kyp Malone (of TV on the Radio), Steve Earle, members of Cro-Mags, Living Colour, Faith, Danzig, and more is now also a Hurricane Sandy Relief benefit. All proceeds will be sent to Amnesty International and the American Red Cross. Tickets are still available. 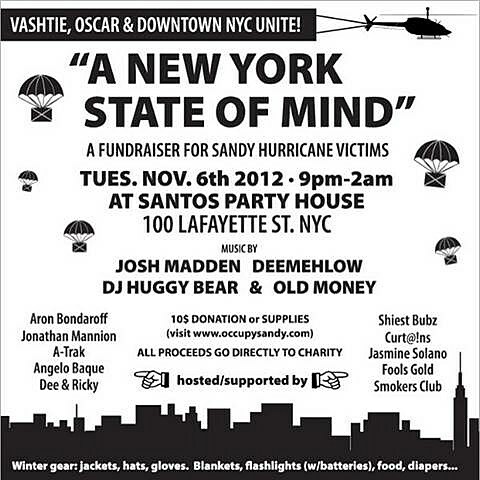 Santos Party House is hosting “A New York State of Mind,” a show hosted/supported by A-Trak, Fool’s Gold Smokers Club, and others with music by Josh Madden, Deemehlow, DJ Huggy Bear, and Old Money. They’re accepting monetary donations or supplies like jackets, hats, gloves, blankets, flashlights, batteries, food, diapers, etc. The flier for this show is below. GrandLife is hosting shows all week, from tonight through Saturday (11/10), at the Soho Grand (310 West Broadway) and Tribeca Grand (2 Avenue of the Americas) with sets by different DJs each night, each benefiting a different organization. Tonight it’s Jared Swiley of Black Lips and Golden Triangle bassist Alix Brown at Soho Grand and Erik Tonnesen at Tribeca Grand, with the proceeds going to Feeding America. 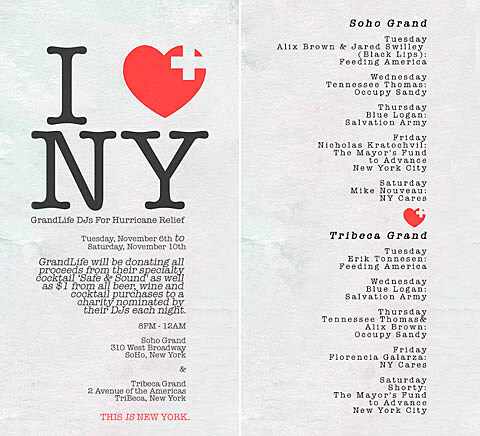 Tennessee Thomas DJs Soho Grand on Wednesday (11/7) and Tribeca Grand on Thursday (11/8) with Alix Brown, with the proceeds going to Occupy Sandy. Blue Logan DJs Tribeca Grand on Wednesday and Soho Grand on Thursday, with the proceeds going to Salvation Army. On Friday, Nicholas Kratochvil DJs Soho Grand with proceeds going the Mayor’s Fund to Advance NYC, and Florencia Galarza DJs Tribeca Grand with proceeds going to NY Cares. And finally, on Saturday, Mike Nouveau will be at Soho Grand with proceeds going to NY Cares, and Shorty will be at Tribeca Grand, with proceeds going to the Mayor’s Fund to Advance NYC. All proceeds from GrandLife’s ‘Safe & Sound’ cocktail and $1 from every beer, wine, or cocktail purchased will be donated. The flyer for these shows is below. The So So Glos will be hosting a benefit in NYC on November 15. More details TBA. This one’s not a show, but Buke & Gase, who once called Red Hook, Brooklyn home, have put out a new single on bandcamp, “Hard Times” b/w a cover of New Order’s “Blue Monday.” The single can be downloaded for $5 or more and all proceeds over the next week will benefit the recovery of Red Hook. You can stream those two tracks below.